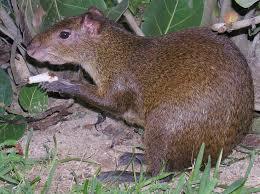 Agutis look like long-legged guinea-pigs, they are actually relatives of the guinea-pigs. Agutis can grow up to 60cm and can weigh up to 4kg. Their short fur is brown or black. They are very shy animals. Agutis are rodents and they are among the rare animals that are able to crack the extremely hard shell of the Brazil-nut. They feed mainly on fruit, plants and nuts.